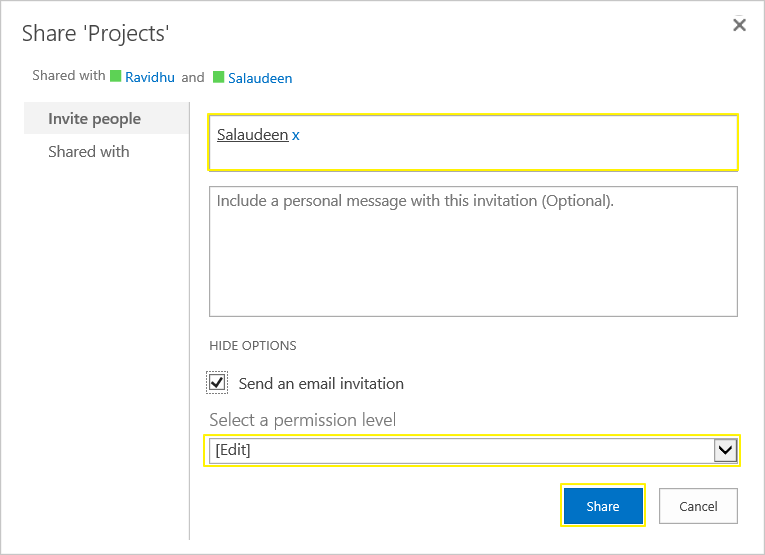 There are times you may want to grant permissions at list or library level to users and groups in SharePoint online. Say for e.g. You may want to provide read access at site level and edit rights on individual list level. So, to grant permissions to lists and libraries, as a first step we have to stop inheriting permissions from its parent and then apply unique security permissions to any level underneath site collection such as: Sub-site, List, Library or list items. On the List Settings page, in the permissions and management group, click on "Permissions for this list" link. In the permissions page, if the list is inheriting permissions from parent, we have to break the permission inheritance. Click on "Stop inheriting Permissions" button. Now, from the ribbon, click Grant Permissions button from Grant group. In the Share dialog box, in the designated text box, enter names or email addresses. Click the Show Options button and then specify email invitation option, appropriate permission level such as edit. Write-host -f Yellow "Permission inheritance broken..."